3 Bedroom 2 bath lake front home. Welcome to the Ossipee House! This truly four season vacation property on Danforth Bay of Ossipee Lake. Winter, Spring, Summer or Fall you'll be located close to activities that make your vacation a real adventure. 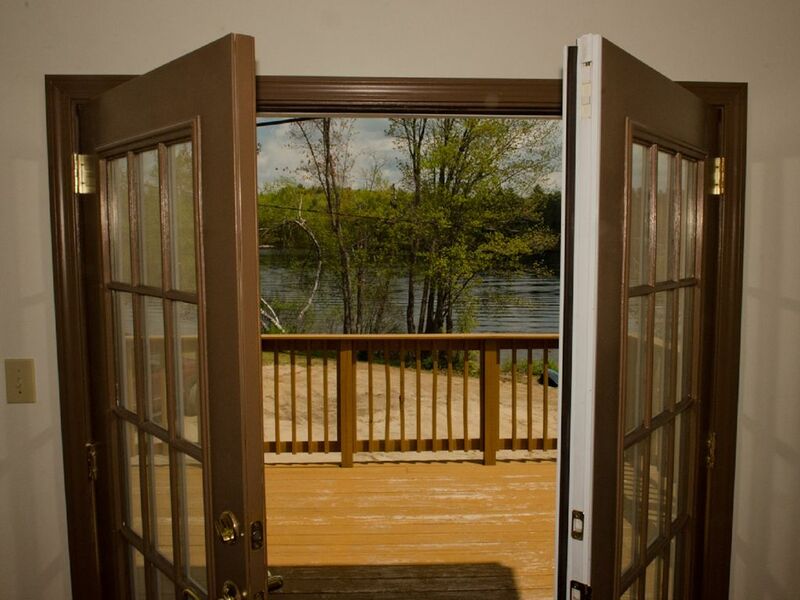 From the deck of the house you are overlooking beautiful Danforth Bay of Ossipee Lake. Take in the scenery or watch the people on the water. Go down to the beach and have the kids make sand castles while you sit back and enjoy the peacefulness of lake living. The beach is perfect for children due to the gradual entry into the water. Make this one of your best vacations ever! We have a private dock for you to tie boat up to or to use for fishing. Spend time around the fire pit to share family stories and roast marshmallows. Summer: Explore beautiful Danforth Bay and Ossipee Lake by canoe or motor boat. You can bring your own motorized boat and launch it from the marina across the street. You will easily get most watercrafts through the channel and into Danforth Bay. You will then be free to go cruising, water-skiing or tubing on one of the bays or the main lake. If you like to fish, you are in luck. Danforth Bay is known for it's outstanding fishing by the locals. You can also swim off from our gradually sloping beach area or just lie on the beach and soak up the sun. If you like to golf there are two golf courses close by. The Attitash Alpine slide as well as various water parks are also a short distance away. If you enjoy mountain biking or horseback riding, you are in the right place. A nearby reserve allows you to explore at your own pace. A few area Mountain ranges with hikes that can last from 2 hours to 10 hours. There is excellent Mountain climbing at cathedral ledges and other areas. If you need assistance, Eastern Mountain Sports in North Conway can set up guided trips if you are interested in various outdoor activities. Finally, nearby attractions such as Castle in the Clouds and Storyland can be an easy daytrip for your family and friends as well as summertime fairs in New Hampshire and Maine (Ossipee Valley fair in mid-July). Fall: New Hampshire is known for its beautiful fall foliage. Take a ride on the Conway Scenic Railroad or the Cog Railroad in North Conway or simply go exploring on your own. Beautiful sites can also be seen while boating on the lake. Attending an area fair in New Hampshire or in nearby Maine can also be a real treat. There are so many things to do on your vacation that you will not get bored! Anytime: Shop 'til you drop in the North Conway factory outlet stores - tax free! Fine Dining and several theaters are also available in North Conway. The relaxation of being at a home away from home. - 2 Bedrooms with a Queen bed in each. - 1 with two sets of bunk beds, 3 twins 1 full size bed, (sleeps 5 people). - Full size couch and love seat in the living room. - Linen for all of the beds. - 1 Full Bath on the main floor, 1 Full Bath on the second floor. - Most rooms either have ceiling fans or window fans for your comfort. We provide clean sheets and bedding for all beds, we DO NOT provide towels. This is a smoke free / pet free vacation rental. We have a variety of lake toys. Great for kids and adults. 2queens, 3 twins, 1 full. Private beach and dock; deck; . Thank you for having us! We (2 couples) spent a weekend here for a nearby wedding at Camp Cody. The location was perfect. I wish we were able to spend more time at the house to enjoy the lake. We hope to make it back another time in order to enjoy more that the property has to offer! Thanks again. Our family had a great time! The house was clean and well stocked. The lake and sandy beach area was great for the kids to play. So clean, this house looks like it was recently remodled. Tasteful decor, lots of amenities. Our family had the most wonderful time here. House was warm and inviting. Clean and neat, felt exactly like home. The owners were such a pleasure to work with. So accommodating and friendly. The house was awesome and most importantly clean. More spacious than the pictures lead to be. I would definitley go back next year. It was a fantastic week with family on the lake and mountains surrounding. Great scenery and clean spacious house exceeded expectations. Winter: Cross-country and downhill skiing - 5 minutes to 1 hour away. Spring: Biking, hiking, fishing or climbing. Summer: On site: swimming, fishing, and boating. Golfing, water parks, mountain biking, horseback riding, hiking, shopping, Castle in the Clouds, and Storyland are all nearby. Fall: Beautiful fall foliage. Attend local country fairs.